Blue Snake Adventures: Master level is a dlc for blue snake adventures base game. Slug, Worm, and Python level are still to easy for you? 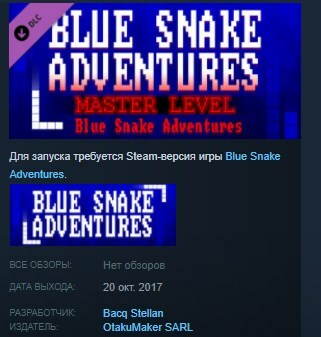 do you want to really master blue snake adventure? Here is master level dlc! Master level is an insane mode for Blue Snake Adventures. One level to choose and master: Crazy speed! Contain leaderboards to beat your friend and succes for this mode to unlock!